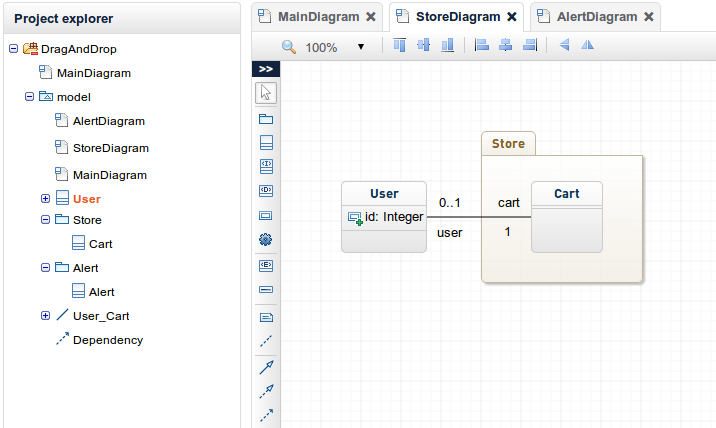 We’ve added a great new drag and drop feature to GenMyModel that allows you to use model elements in multiple diagrams. 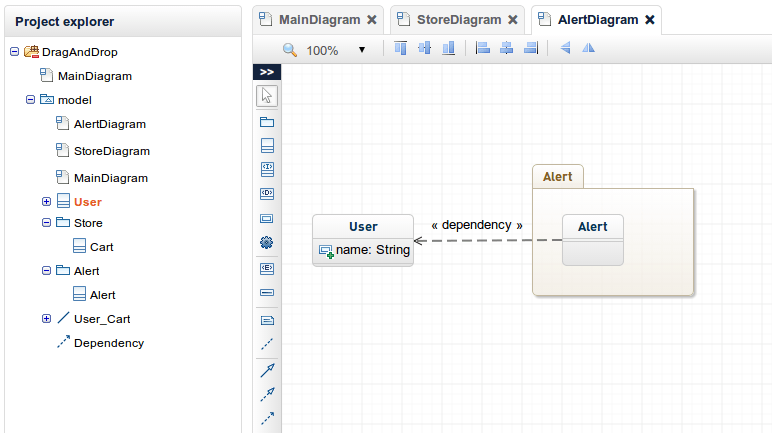 This will make creating your UML models even easier! ** use the same element in different diagrams**. A kind of Model-View for your UML projects. You will also keep the relationship between the different elements when you use them** in different diagrams**. User in your project, it appears in the project explorer on the left. It’s common to use the User class in different packages or modules. For example, the User class may be in a package called Store and another one called Alert**. *The class *User exists once in the models but it appears in the two different diagrams which are no more than two different views. 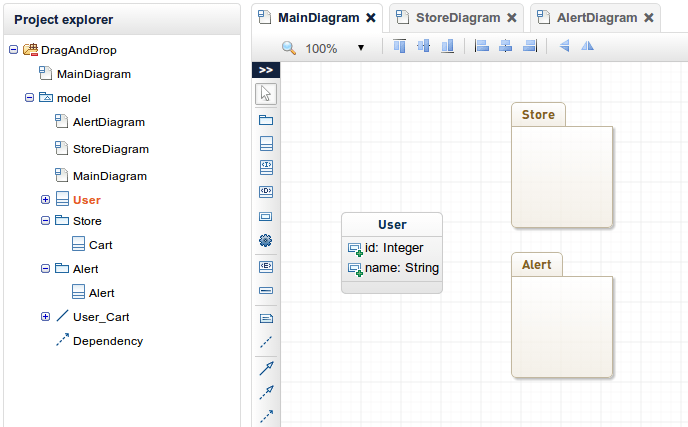 StoreDiagram: in this view/diagram, we only show the User class and the Store package. We still have only 1 class User in the model! AlertDiagram: the User class is reused with a dependency in this diagram. This is a typical feature of modeling tools. Drawing tools do not allow this kind of reuse as there’s no structured data behind the shapes and lines. Remember the Difference Between a Model and a Diagram? Models are abstract representations of a system. Models often contain one or more diagrams that display an aspect of a model or a subset of the model’s elements graphically. In this way, a diagram represents a certain aspect or part of a model. Diagrams can exist outside a model or within a model. Diagrams illustrate the quantifiable aspects of a system that can be described visually, such as relationships, behavior, structure, and functionality. When a diagram is deleted from a model, the elements remain part of the model. 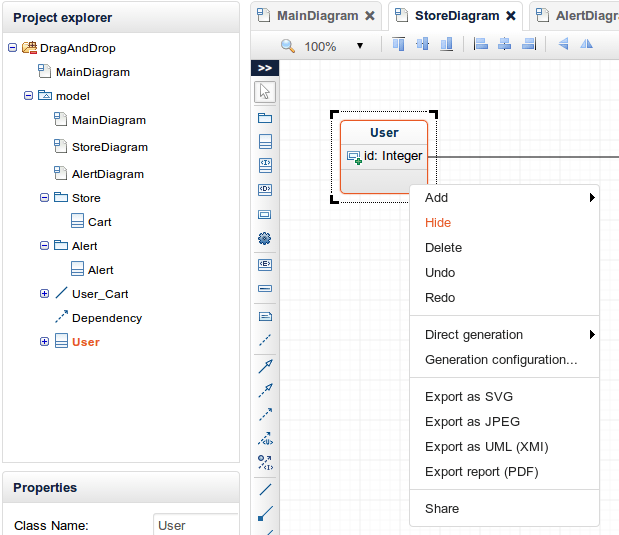 drag and drop, you simply drag an element from the Project Explorer and drop it the diagram you want. Use the menu (right-click) and Hide *rather than *Delete to hide an element from a diagram. Notice that Delete will remove the element from the model, i.e from all your diagrams.